Happy Would You Read It Wednesday, Everyone! Today’s pitch comes to us from none other than This Kid Erik! Eleven-year-old Erik plans to eventually take over the world. Right now he’s a bit too young, so he is spending time as a fifth grade student, book review blogger and hopeful writer. Erik blogs at This Kid Reviews Books. Age/Genre: Chapter Book (ages 7 and up) – intended as the first of a series. The Pitch: For years the evil villain Wintergreen has tried to destroy super crime-stopper, Tomato, and his sidekick, Pea, and take over planet Oarg. In a plan gone wrong, Wintergreen and his gang tangle with Tomato and his friends in a runaway rocket ship that crashes on a strange planet called EAR-TH. Follow this brawling bunch of aliens as they try to get along, survive all the dangers on the strange planet, and find a way to get back to Oarg. Please send YOUR pitches for the coming weeks! For rules and where to submit, click on this link Would You Read It or on the Would You Read It tab in the bar above. There are openings in June so polish up your pitches for your chance to be read by editor Erin Molta! Thanks for your comments for Erik, Penny. And I know! Isn't Stacy amazing? I know it – I like that bad guy angle too 🙂 Thanks for coming over, Michelle! Yes I would certainly read this. I can just imagine the cover of this story, very bright and eye catching. Loved the tightening advice Wendy and the others have given. Great job Erik, Whoahoo! Erik's story sounds great. I read the pitch to my 7 year old daughter and she said “I'd like to read that story. Can you get it for me please Mum.” I liked how he used runaway rocket ship and brawling bunch of aliens. The story sounds adventurous and the pitch entices you to read more. I don't know how I missed this – WAIT – I was sick on Wednesday! I like Wendy G.'s suggestion to tighten the first two lines. But I'd suggest tightening a little more “tangles with super crime-stopping duo, Tomato and Pea,…”Good luck, Erik! 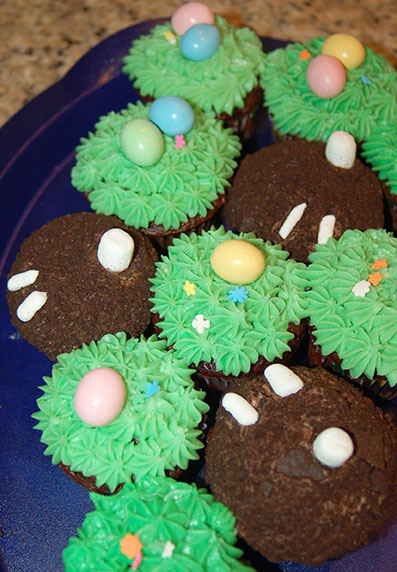 Stacy's cupcakes inspired my angel food rabbit hole cake for Easter! This last sentence could be tightened: “… try to get along, survive all the dangers on the strange planet, and find a way to get back to Oarg.” I'd like to see specificity – what kind of dangers? Italian chefs? Gum chewing teens? And more emotion around why they have to try to get along now that they are stuck on earth together. Good job, Erik! Thanks so much for chiming in for Erik, Rachel – and sorry I somehow missed this until now!